As of August 1999, Union Bankers Insurance Company became a wholly owned subsidiary of Universal American Financial Corporation. Universal American is a Fortune 500 company, currently ranked at number 401, with 2010 revenues reaching nearly $5.7 billion dollars. Universal American markets health insurance products including Medicare supplementary programs to older adults in all 50 United States and the District of Columbia. 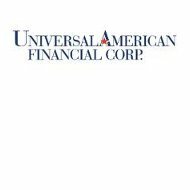 Universal’s portfolio, offering senior care medical coverage and Medicare supplements includes Medicare drug benefit options and the trademarked “Medicare Advantage” series of programs. A separate Universal website, http://www.universal-american-medicare.com/, provides users with detailed information about Universal’s many Medicare contract program options. Each distinct plan has its own website, tools, information, and forms. Available plans and options vary from state to state so it is important to enter a current zip code so you will see the plan details and options for your city and state. There is also a handy glossary of terms to aid subscribers in clearly understanding program guidelines and benefits. The insurance industry touchstone publication, “Best Insurance,” rates Universal with a “B++,” very good. A.M. Best gives Universal the same very good rating, “B++,” for financial strength. Universal American is a publicly traded corporation and a member of the New York Stock Exchange (UAM). The investor relations page, provides comprehensive up-to-date company financial information. The biggest story for Universal American, in calendar 2011, has been the sale of Universal’s Medicare Part B prescription drug business to the CVS pharmacy chain. This transaction closed at the end of April when CVS paid an estimated $1.25 billion to Universal for this segment of their Medicare insurance business. A major portion of Universal American’s website is devoted to the subject of Medicare fraud. Universal is committed to fighting systemic waste, fraud, and abuse in the health care industry. According to Universal, between 3 and 10 percent of our country’s total health care spending is lost, due to mismanagement and fraud. Don’t give out information of a personal nature over the phone or online unless you placed the call or opened the website. Be aware of thieves offering to provide “medical” services free if you give them your insurance information. Examine all bills to make sure that you received all the services, drugs and other products you were billed for. I have been trying to work with Union Bankers Insurance to get help with my aunt’s nursing home. She has had this policy since 1988. They continue to refuse coverage of her policy since she has not had or needed a hospital stay of 3 days. She has advanced dementia and cannot take care of herself or stay alone. She needs the nursing home care and to be in a secure environment, but they continue to deny her claims on her long-term care policy. Union Bankers Insurance now Constitutional Life under Universal American canceled our mother’s policy for maturing. They said, she’s 85 now and her policy was canceled. She has been hospitalized since September 2016 and will need more care in rehab. She has had the policy since 1978. They have collected her premiums for 38 years! She needs the support and her policy reinstated.